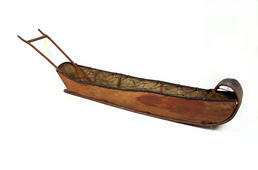 This is a full-sized Gwich’in toboggan or “Yukon sleigh,” used for hunting, hauling meat, wood, and water, and carrying passengers. (1) Long boards run the length of the sleigh and turn up in a curve at the front. They are tied back to the bed of the toboggan with cords of babiche (leather thong). The sides are heavy moose hide, and moose hide ropes criss-cross the top. A steering bar is mounted at the back. The driver would also have a drag brake that he could stand on to stop the toboggan or keep it in control when going downhill. Toboggans ride on top of deep snow rather than sinking into it, making them easy to propel. Originally they were human-powered, with men pulling in front and women pushing from the back. (3) After European contact toboggans were pulled by dog team.